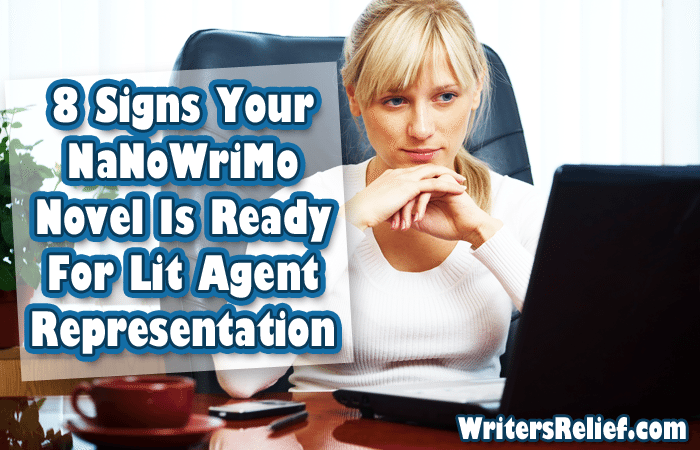 8 Signs Your NaNoWriMo Novel Is Ready For Lit Agent Representation - Writer's Relief, Inc.
After National Novel Writing Month is over, literary agencies are often flooded with 50,000-word manuscripts that, frankly, aren’t quite finished or polished enough for a successful agent-writer connection. NaNoWriMo books CAN become best sellers (here are a few that did!). But how do you know if your novel is truly ready for submission to a literary agent or to a publisher? This handy guide can help. 1. You know your genre and your audience. If you’re writing in a commercial genre, you’ve embraced the tropes that your audience expects (in other words, you give them what they want!). And your novel’s word count is spot-on for publication. Learn more about word count and genre here. 2. You’ve taken a break. We recommend putting your book away after NaNoWriMo for at least two weeks! When you return to your book, you’ll be able to look at it from a fresh perspective. 3. You’ve workshopped your novel. You know when to carefully consider advice from your critique group and when to let it slide. And you don’t take criticism personally. 4. You’ve had a professional reader (who has expertise in your genre) review your book. The difference between having a professional look at your book and having a fellow aspiring author look at it can be very dramatic! Give your book the best possible shot (if you can) by engaging a professional freelance editor and making the necessary revisions. 5. Your summary is stellar. Whether you’re composing a teaser blurb for a query letter or making an elevator pitch to a literary agent at a writing conference, you can easily and smoothly summarize your story in a way that’s engaging and exciting. Why does this matter? Because first impressions count the most in the world of publishing. 6. You have a working knowledge of the publishing industry. You know how to play it safe and smart when you begin submitting a book to literary agents and editors—unfortunately, not everyone is honest! You can spot a red flag from a mile away. 7. You have a professional outlook on your submission process. You know the etiquette of making submissions to literary agents and to those independent publishers who read queries from unagented writers. You’re emotionally prepared for rejection letters. You have a great author website so agents and publishers can learn more about you and your project. And your author bio is as strong as it can be and includes any publication experience or participation in writing conferences and trade organizations. 8. You’re at ease with your project. You’ve brought your story as far as it can go. Your instincts are telling you it’s time to send your book out into the world. Do You Have A Strong Submission Strategy? Having a great book is—obviously—the essential first step to getting the publishing contract of your dreams. But if you don’t make strong, well-targeted, smart submissions (and a lot of them! ), your great book might never make it into the right hands at the right time. At Writer’s Relief, our staff thrives on helping our book author clients connect with literary agencies. If you want to learn more about how we can help you get an agent, you can start here. But if you’re set on taking a DIY submission approach, here are the 7 signs of a successful submission strategy! QUESTION: How do YOU know when a book project is done?